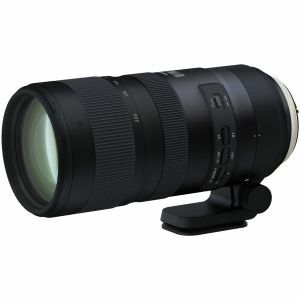 A popular telephoto zoom for a variety of shooting applications, this SP 70-200mm f/2.8 Di VC USD G2 Lens from Tamron is characterized by its bright f/2.8 constant maximum aperture, as well as sophisticated optical and physical designs. In regard to optics, an improved layout contains one XLD element and five LD elements to suppress color fringing and chromatic aberrations for notable clarity and color accuracy, and both BBAR and eBAND coatings have been applied to reduce flare and ghosting. Spanning a useful range of telephoto focal lengths, this lens is designed for FX-format DSLRs, however can also be used with DX models where it will provide a 105-300mm equivalent focal length range.